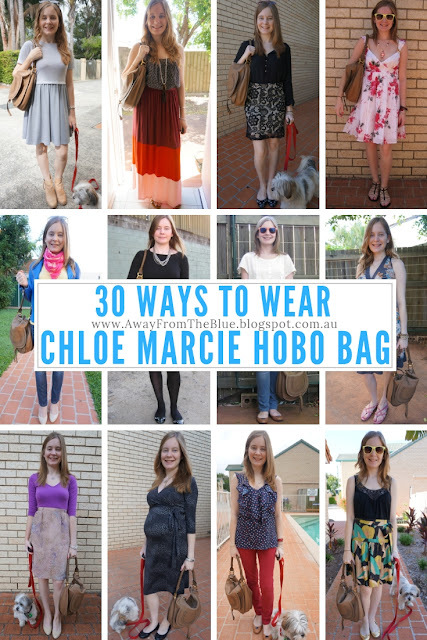 That Chloe hobo bag is the perfect bag to go with everything! I have yet to spend over $300 on a bag (which was a gently-used Chloe, by the way) but it was a wonderful bag. I should list it for re-sale because I haven't used it for years. I didn't see anything to cringe about in your photo gallery! You did a great job lowering your budget and I hope you have good luck in sticking with it for 2019. I saw 2 things on sale that I really wanted to buy yesterday, and I don't know that I'm going to be strong enough to not buy them (one was a sequin T-shirt in rose gold). *sigh* I hope you have a happy, healthy, successful 2019! The white one? It was such a beautiful dress, but a no-go after kids, I need a supportive bra which doesn't work under it, haha! It was fun to look back and see how much your hair has grown since some of these old pics. You look SO pretty in that pink floral dress! Hopefully I'll be able to cut it that short again soon, once I get a few more centimetres to donate! It's such a great bag! I love the details on it. I think it's good to include them so I get an overall picture of what I bought but it is an even more impressive figure without including them! Wow that bag looks great with all your outfits darling. Wishing you a fabulous 2019! Good luck on the budget! I love the size of this bag. Hope you're having a great start to the new year! What a lovely Chloe bag! I'm not a bag lady myself, but the design caught my eye. The colour is wonderful as well, and you wore it so well- in all 30 outfits. However, since you were sure you won't wear it that much in the future, you did well by selling it. I think the right way to calculate a price per wear is to use the price difference. If you sell the item, you save up money so that should probably be taken into account. You did great this year, congrats on achieving your goals. I do like how you always rotate items in your wardrobe and set 'wear' challenges for yourself. I sometimes get stuck in a rot and only wear my favourite items over and over again. 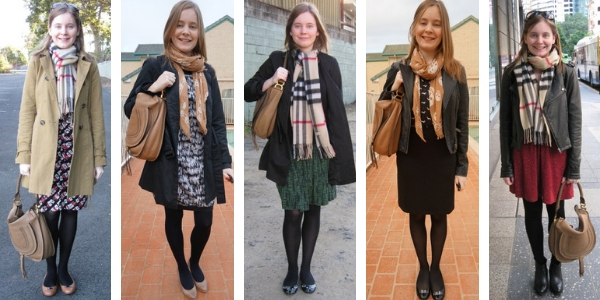 Having a blog is a great way to keep track of our outfits. 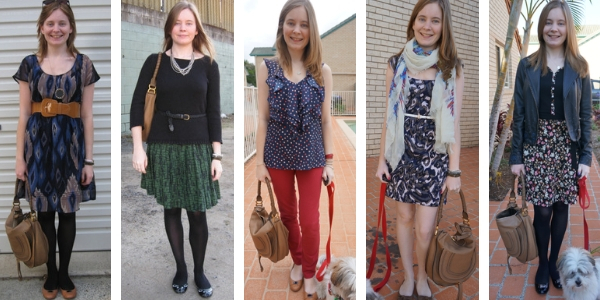 I think blogging helps us with developing our personal style. Keeping a visual record of our outfits is the best way to see what looks good on us. I think that does make sense - as you get the money back when selling it so it doesn't add to the cost of the item? Wasn't sure so I didn't calculate it this time around. 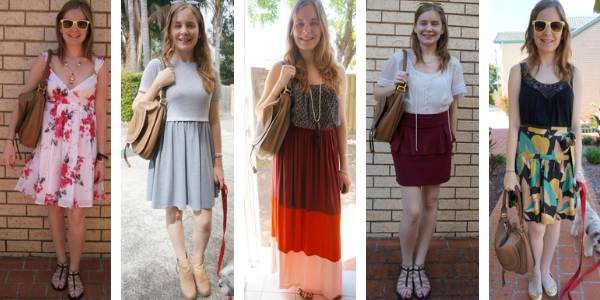 I definitely think blogging helps with my style, I often look back in the blog for outfit ideas! I love how you layer different styles! You look so fabulous and chic darling! You really have a thing, and a good eye, for beautiful bags! Happy weekend Mica! Such a cute bag! 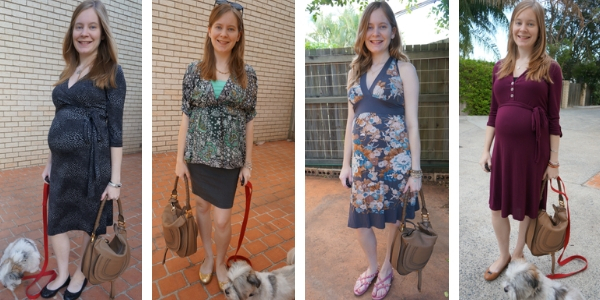 Love all the ways you styled it! I really love all your outfits and bags! I wish I could get brave and do a style haul on video or a travel one..kudos to you, you did great, and thanks for commenting today on my blog! Sounds like you are in the UK? I love how there are so many ways to match your outfits with the hobo bag! Ooh, I am SO IN LOVE with your Burberry scarf. I need to get one of my own one of these years. It's great that you can use it in so many different occasions. Thanks for sharing these looks! It is a great scarf, even if it's worn sparingly as it's quite thick for Brisbane winters! I don't think you need to cringe when looking at the older photos. You have a wonderful sense of style and it evolved, but it was still unique and you clearly enjoyed it. As long as you're happy with the use you got out of the bag, that's all that matters. Thanks Kathrin! I do much prefer my outfits and photos now haha! You've totally worn this bag in every possible way, all really stylish. I hope you achieve your 2019 goal and have an amazing year ahead. It is an awesome visual diary! 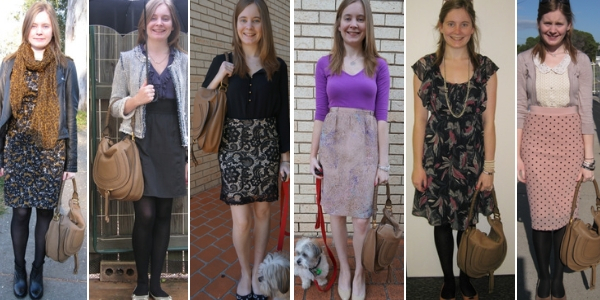 I know I've not been doing it as long as some bloggers but I really enjoy having an archive of outfits to look back on! I also find what I bought in Reebonz an investment which I can resell more or less the same amount from what I bought. Good on you to be able to stick to your planned budget. You're an inspiration, I hope I can be more like you hehe. Hope you had an awesome New Year celebration. Yes, you can get some real bargains there if exchange rate, sales, and discounts align! Great tips! Thank you so much for sharing, I love your style! btw you won my art giveaway. I sent you an email. Responded to your email - I'm so excited to have won! I love all of your looks, you are so cute, and this bag look amazing with all outfits. I love your looks! :-) The bag is pretty too! All the styles are really nice!! That Chloe bag is gorgeous so versatile! Congrats on beating your budget! I'm trying to rewear more this year too! Good luck with your rewearing goals! I think it is wise to sell a bag that you think you won't wear again that often - especially after 30 wears! No, your outfits from the past don't make me cringe! You looked also in the past beautiful. You have good hands for outfits! Yes, I sell handbags to buy new ones, handbag circle of life, haha! I love looking through the older photos of you as well! You have such lovely style. That is a really gorgeous bag. I like that you try to calculate cost per wear with these items as well. That's a great idea! I hope you had a wonderful first week of 2019! My brother in law is visiting right now, so I'm a little behind on blog posts. But I'm hoping to read yours all next week! Wow you have many bags (I saw your post about the bags), I have sooo little bags! So in 2019 instead of buying shoes and coats, I will try to buy more bags :)) I love Chloe bags by the way. They are never out of style, very feminine and classy. I also like their smaller brand - See by Chloe, bags are affordable, beautiful and also great quality! haha yes, I do love buying bags! I haven't had any See by Chloe bags but I agree they have some very cute options! What a great bag, I really like your winter layers and summer looks! I really, really love your style! What a great post. And amazing how you came up with 30 outfits, that's really amazing. I think the bag is also really, really pretty. I really love that you get your money's worth when your bags! 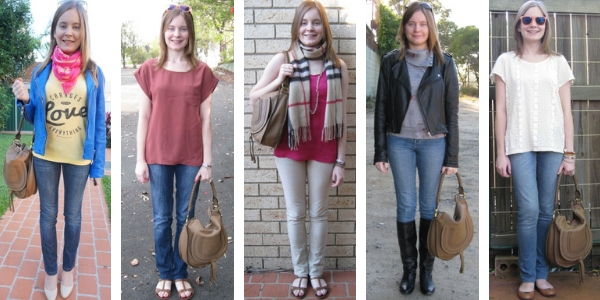 I love seeing you style them different ways in different season! That bag is so classic! Hope you have a wonderful 2019 so far! Happy New Year! First off wishing you all the best in the new year and second I love the bag and the way you styled it! gorgeous! I just can't resist buying more, so I have to make room by selling others, haha! You looked so beautiful, Mica... even in the past! it's the best way to do it I think! Wow so many great outfits and beautiful bag! Your little doggie is too darn cute :)!!! I regularly sell off my hand bans as soon as loos interest in carrying them. That bag and those outfits are giving me ultimate fashion inspiration. Love how you were able to get 30 outfits ideas in multiple seasons and occasions. Hope you fulfill your goal for this year! Yes I was surprised I wore this over 30 times as I didn't think I had it long before selling it! You did awesome on your spending for 2018. Good Luck with your 2019 spending. Also that so nice you got some hand me downs from your sister. I hope you have a great week. I'm just praying the Flu bug left my house. It was a mess last week. We all got it. Yes, I'm so lucky to get so many pieces from my sister! Hope that you are recovered from your flu! Loving this bag's style, so chic and classic. Your style is always fab! I admire your commitment to reducing mindless spending! That hobo bag has been part of your life for a long time and you took real good care of it! That's really amazing Mica. I've stopped shopping on clothing for quite a while that I didn't really think about it. I have tons of clothes and some are gifted that I don't see the point of getting new ones. The last spend was on a pair of running shoes and that's because I use them to the limit! Thank you for inspiring me with your mindful fashion habits. It was nice to look at the photos of you from different stages of your life! So beautiful. Can we please see how you'd style jeans in 2019? Hehehe! Thank you! I still have the odd impulse buy, but I'm trying to be more considerate with what I get! Oh wow Mica I am in total awe- you only bought 30 items in 2018! You did such a great job! I still have not done my yearly recap, I have been procrastinating as I don't want to add up. I love the Marcie style, just would get it in a different size or shape, this wasn't the perfect fit for me, I like the cross body ones! I'll be interested to see how I do with my shopping this year!